In the later part of 2017, I was asked to express the nature of a specific type of paper and to design an art installation for the 2018 London Craft Week. The installation was to be assembled by university students in a show room called the White Space in London. Coincidentally, the year 2018 would also mark the 50th anniversary since the first discovery of the Sonobe technique. So, I thought it would be interesting to showcase this origami technique as a tribute to its creator, Mitsunobu Sonobe. However, not in its original folding, assembly method or common overall form, but rather, as an interlocking system that allows the material to respond to changes in environmental conditions over time. One of my first tasks was to select 1 or 2 papers that I would be using for the installation. With hundreds of papers to choose from in the entire G . F Smith Collection, several questions came to mind: where do I begin? how do I select 1 or 2 papers from the rest? To be honest, I had no idea where to start. So, I revisited the big idea, which was to transform the Sonobe method into an interlocking system that would express the natural qualities of the chosen paper. With that in mind, the only process that made sense to me was to start by folding the different types of papers to see which would tear or crack first, also known as a folding endurance test. Since the installation would require folding and unfolding the same crease, the chosen paper would need to prove that it would not crack or tear if folded in the same place over and over again. After weeks of investigation, I arrived at the conclusion that Takeo Tela showed the most promise. The images below illustrate some of the results of my investigation. Following the folding endurance test, I started looking into its tensile strength by adding weight to different sides of the paper. During this hands on process, I realized that the paper was very coarse. This led me to the following question: can Takeo Tela support itself when connected from two points spanning a distance of 1m through its frictional properties alone? After running through a bit of the physics, I realized that there were several missing pieces of information, such as the coefficients of kinetic and static friction, that I needed to know in order to complete my initial calculation. To find out this information, I contacted Takeo directly. But, this information was not readily available and my next internal deadline was approaching, so I made a mock up. I suspended the original Sonobe from two points and observed its behavior as it was subjected to gravity and its own weight. To my surprise the papers stayed connected for two days without any glue (primarily on friction alone). After months of investigation (which included the paper selection process and 8 different full scale prototypes), I finally reached a breakthrough in late January 2018. The three methods that I had been developing were finally working and able to support itself while undergoing changes to its shape in response to gravity. They consisted of two interlocking joints and one based primarily on friction. The folding and assembly method became an extension of the original Sonobe technique. Rather than sliding individual units together and gluing them to form tetrahedra, they are folded into one another, creating a new interlocking system. This new system meant that the 5500 interlocking papers, which originally could be assembled by combining independent terahedra into separate modules and joining them to form a larger whole, could only be done in series by adding a single unit of paper at a time and in a particular direction. The methods that were developed resulted in tetrahedra that look similar to the traditional Sonobe method. Since this installation was a tribute to Mitsunobu, I thought it was important to keep the tetrahedra so that people visiting the installation could see the resemblance to the original. But, the overall shape could deviate from purely regular geometry into the form of something more natural and unexpected. 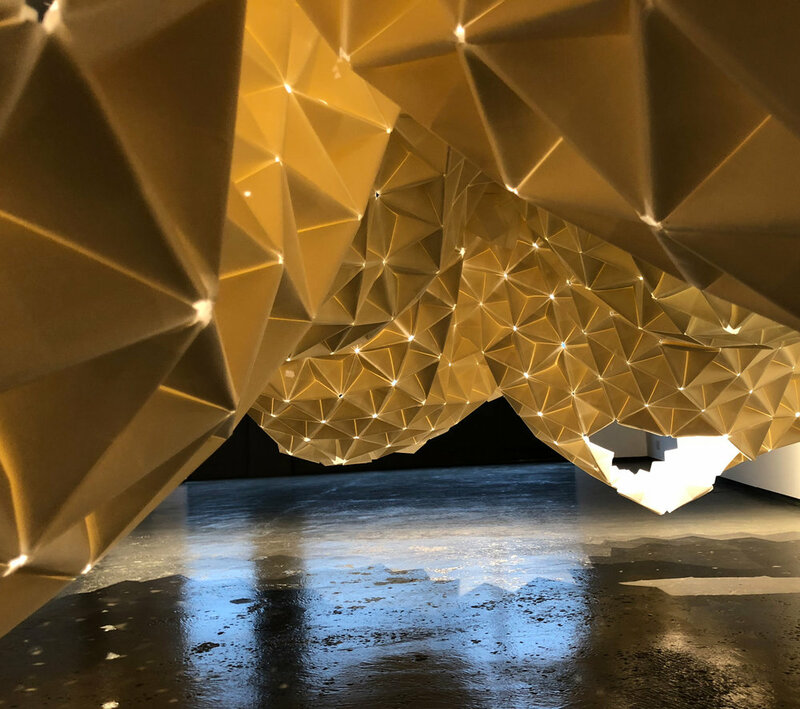 The result of this new folding and assembly method also creates variations in light and shadow that are experienced from inside the installation. Due to the nature of this method, there are anywhere between 2 and 12 layers of paper overlapping one another at any given time. 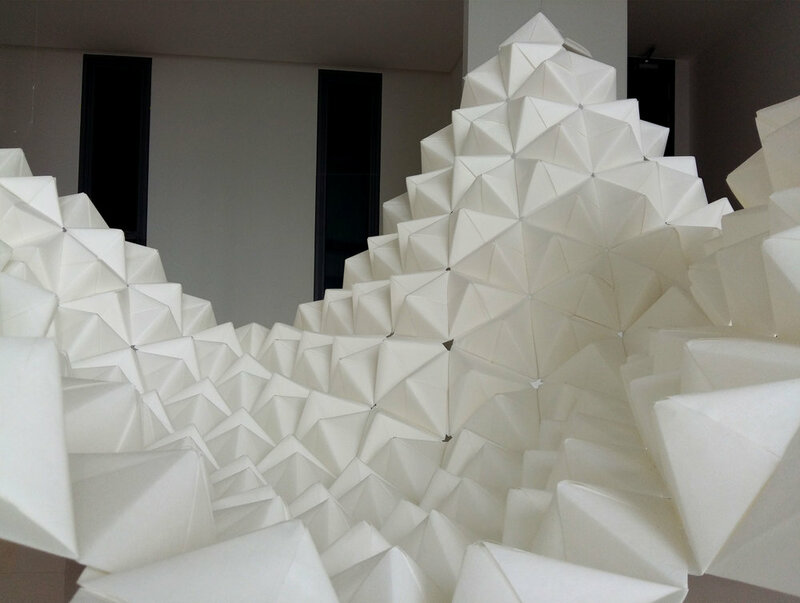 For example, areas around the highest points of the installation (where the 16 connection points are located) have 12 layers of paper to increase its rigidity, while the lowest parts have only 4. The varying thicknesses allow light to transmit at different intensities, which in turn result in different lighting conditions that can be seen from below the installation. 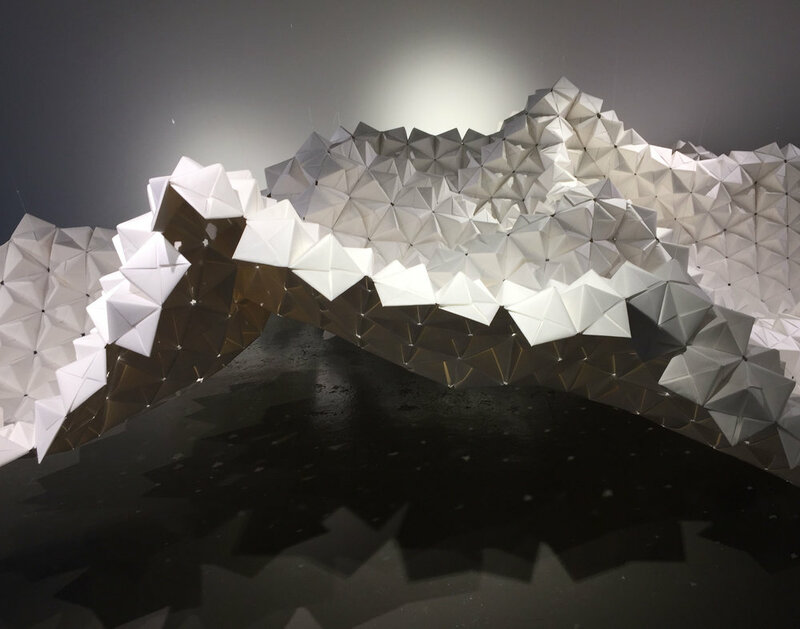 Altogether, the natural qualities of the paper are expressed through its response to the environment, such as humidity, gravity, temperature and light. As these environmental conditions change (with the exception of gravity) so does the experience of each visitor. This blog was created to document the thought process behind our work.